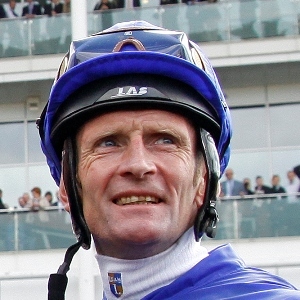 Kevin Manning has been with trainer Jim Bolger throughout his career, joining the yard in 1982 and riding his first winner in 1983 on board Keynes at The Curragh. Manning is married to trainer Jim Bolger’s daughter Una, with whom he has a daughter, Clare, and a son, James. Manning was twice Irish champion apprentice in 1984 and 1987 and he became number one jockey to Bolger in 1993, replacing Christy Roche. His first Classic success came on Margarula in the 2002 Irish Oaks. He hit the headlines in the UK in 2007 when partnering Finsceal Beo to victory in the 1000 Guineas, before doubling up in the Irish 1000 Guineas, and again in 2008 when winning the Derby on New Approach, on whom he was beaten a nose by Henrythenavigator in the 2000 Guineas the previous month. Bolger and Manning have won the Dewhurst Stakes on no less than five occasions, with Teofilo (2006), New Approach (2007), Intense Focus (2008), Parish Hall (2011) and Dawn Approach (2012). Alexander Goldrun was another great Manning/Bolger success story, winning amongst other races the Prix de l’Opera, Hong Kong Cup and Nassau Stakes. The latest stable star was Dawn Approach, who maintained his unbeaten record when storming to a five length victory in the 2013 QIPCO 2000 Guineas, the opening race in the QIPCO British Champions Series. He flopped in the Investec Derby, but bounced back for a short head victory in the St James’s Palace Stakes under a fine ride from Manning who went on to ride Trading Leather into second place in the King George VI and Queen Elizabeth Stakes (sponsored by Betfair) and the Juddmonte International at York. Dawn Approach did get beaten under Manning in the QIPCO Sussex Stakes at Goodwood by his old foe, Toronado, and he also succumbed in the Queen Elizabeth II Stakes when Olympic Glory was victorious. He first register in the 2014 QIPCO British Champions Series was on Trading Leather, who notched his third second in the Series, this time in the Coral-Eclipse. Manning almost got back amongst the winners in the British Champions Series as Lucida went down by three quarters of a length to Legatissimo. This was an admirable effort given that he was almost unshipped coming out of the gates and had to readjust his irons early on in the 2015 QIPCO 1000 Guineas.